Visiting our Austin location for a meeting or event? The entrance to the Omni Hotel parking garage is located on the east side of Brazos Street just north of 7th Street. 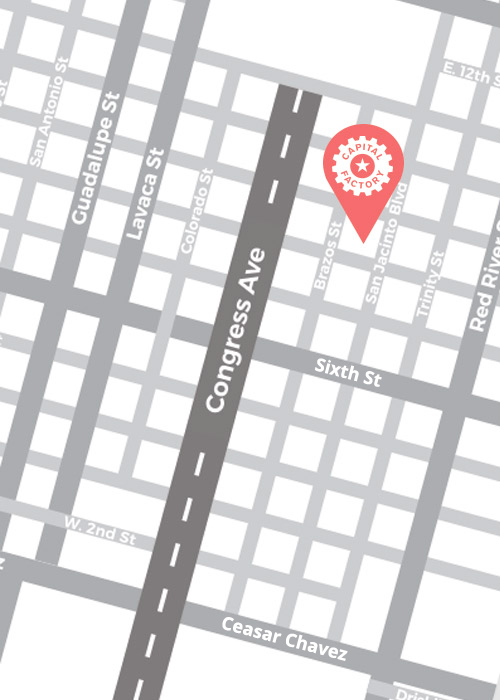 Capital Factory offers parking validations in Austin Monday-Friday, between 5 pm-10 pm. Guests must enter the garage at 5 pm or later and leave before 10 pm to have their parking validated down to $7. Additionally, guests will need to scan their original ticket and then the validation. Below are some other parking options around the area. Metered parking is available on the block surrounding the Omni Hotel/Austin Centre building. It’s inexpensive during the day and it’s free on Monday and Tuesday evenings after 6:00 pm. During the hours below, metered parking costs $1 per hour. Meters have a maximum length of stay that varies by area. Metered parking is free during the hours not listed. Meters take MasterCard, Visa, debit cards or coins. Between Cesar Chavez and 10th Street, and between IH-35 and Lamar Blvd. The Omni Hotel parking garage prices are as follows (with the exception of special events). Valet parking is available at the Omni Hotel valet located on 8th street between Brazos and San Jacinto. Capital Factory is bicycle friendly! There are bike racks in the garage and members can also reserve a bike spot near the kegs on the 16th floor. car2go is also a good option for downtown transportation. Many Capital Metro buses drop off within a few blocks of Capital Factory. Many downtown lots and garages offer monthly rates. Capital Factory members can buy monthly parking in the Omni Hotel garage and the St. David’s garage next door, depending on availability. Please contact a staff member for assistance. Visiting our Dallas location for a meeting or event? The entrance to The Centrum’s visitor parking garage is located off Welborn Street, between North Hall Street and Cedar Springs Road. Please use the elevator closest to Oak Lawn Avenue and select Floor 1 for the easiest access. Parking validations are available for Capital Factory guests Monday through Friday from 9am – 5pm. See our front desk for assistance. Visitors to our Dallas location must use their phone number to enter and exit the visitor parking garage. The Centrum visitor parking garage prices are as follows (with the exception of special events). Capital Factory is bicycle friendly! There are bike racks in the visitor garage near the entrance on P1. Members can also access the bike closet, located next to the bike parking space in the visitor garage, with their member access card (coming soon!). The Dallas Area Rapid Transit (DART) Cityplace/Uptown Station is located a few blocks away. Parking details and fares can be found here.